There are plenty of books on changing your life. 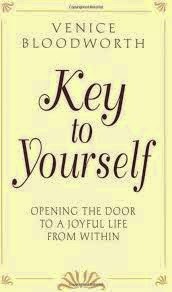 In this article I will talk about the book Key to Yourself which was written by Dr. Venice Bloodworth. She was an inspiration to many people before she passed away and she was also known through her works, to many people within and around the vicinity of Atlanta, Georgia, as teacher, counselor, and friend. Dr. Bloodworth received her doctorate in psychology from Northwestern University which is located in Chicago. She didn’t limit her teachings only to psychology and what she learned in school. Venice Bloodworth enjoyed talking about Jesus and how what he taught can be practiced by anyone in the world. She enjoyed teaching people how to change their life so they can be happy. In the Book Key to Yourself she talks about how Jesus told one of his disciples to walk to him on the water. Jesus didn't say to his follower to walk only if the sea was calm or anything else. He said, "Come!" and the disciple did walk on the water just as Jesus was doing. But the disciple became afraid and he sank into the sea. That's when Jesus said, "Oh ye of little faith, why did you doubt?" One of the most important things I learned in Key to Yourself is to perform affirmations in the present tense. When you want something write your affirmation as if you already have what you want. For example, instead of writing, 'Can I have a 2014 Camaro' you're supposed to write, 'I now own a 2014 Camaro'. And you have to say your affirmation over and over for 10 minutes at a stretch if you want it to be effective. I've been able to perform miracles with my mind. You can too! To get what you want out of life you simply write an affirmation then you say it over and over for 10 minutes at a time. Say it every morning shortly after you wake up and every night right before you go to sleep. You may be wondering how long it'll take for your affirmation to manifest. I wish I had an answer for you, but I don't. The only thing I can say is that I have made things happen in a matter of minutes and things have taken months to manifest in my life. What ever you do, don't stop saying your affirmation until what you want manifests in your life. If you stop the affirmation,, the universe will stop working to get it for you and you'll go back to the way your was before you began performing the exercise. I don't know why this happens. I have experienced it, so trust me when I tell you that you cannot stop your affirmation until it happens. In describing her work Dr. Bloodworth has said this: "The method is always the same, regardless of what is to be accomplished. First, the idea. Second, visualizing the idea. Third, manifesting the idea. First we make a decision; then, we use the marvelous function of the mind, the imagination, which I call the workshop of the mind, to visualize this change. Since it is a law that energy follows thought, then when the thoughts are flowing in a positive manner, we get positive results." The beauty of Key to Yourself is seen through Venice Bloodworth’s insightful approach to combining modern psychology and the very same principles taught thousands of years ago by master teachers such as Jesus. In searching for her own spiritual enlightenment, Venice Bloodworth found the root of true happiness based on concepts of spiritual psychology that disclosed the power of the mind to think itself to wellness, prosperity, and peace. Although the world has changed drastically over time, people are still confronted with the same fears and inner conflicts. Key to Yourself meets these challenges with ageless wisdom and boundless compassion. This beautifully written book puts forth new concepts of reality. Bloodworth felt these concepts, which are inherent in most religious philosophies, would be proven by modern psychology. In fact, they have been proven by modern physics. Bloodworth's book reduces complexities to simple to understand certainties in much the same way the movie "What the Bleep Do We Know" puts theories of physics into easily understood pictures. Her work will uplift even the most down trodden spirit.